It all began with a trip to Paris, and a stay at the iconic and luxurious Shangri-La Hotel, located just a quick walk across the Seine from the infamous Eiffel Tower. The big day arrived, though little did Sarah know what was in store for her throughout the day and late into the magical evening to come. The morning started with a trip to the Shangri-La Spa, and followed with a private, romantic boat tour on the Seine. Of course, during this time, an incredible team of passionate individuals were working swiftly to make sure every detail of her evening with Fawwaaz would be perfectly memorable. What was MY role in all of this? By this point you've probably guessed it - I was her makeup and hair artist, to ensure that she looked stunning throughout the evening! But here's the catch - I had to keep everything a secret and play along, all while pretending like I didn't know anything about her special "event" that night. 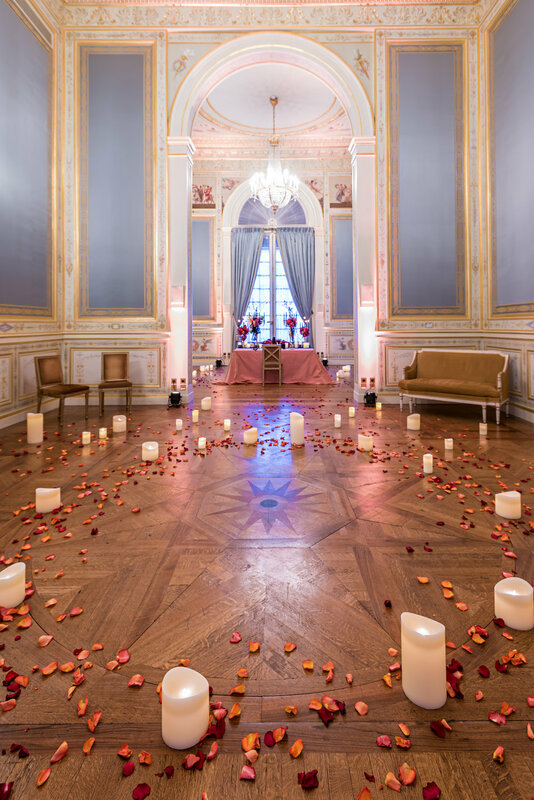 You see, Fawwaaz hired one of the best planners in Paris to organize a very special proposal for the love of his life - Jean-Charles Vaneck of Sumptuous Events Paris. Jean-Charles created a scenario and script (yes, it was that elaborate! ), and my role was to help Sarah get beautified for an exclusive "Fashion Gala." And so, I arrived that afternoon with all my makeup and hair equipment and created a beautiful, timeless look for her, all while feeling extremely giddy inside about what was to come. When I left, Fawwaaz nervously walked me to the door, and while we both knew the real magic was about to happen, we simply smiled and said our goodbyes, further playing along. During my beauty appointment with Sarah, Jean-Charles prepared the entire hotel salon for the couple, with romance written all over it - live music, candles, rose petals, intricate bouquets, and more candles! The couple then left the hotel in a Bentley for their "event," only to be driven back within just a few minutes (stay with me, this is all part of the script!) due to an "error" on the driver's part. This was the big moment for Fawwaaz to act confused while leading Sarah to the best part of their evening. As they continued toward the staircase, Sarah found rose petals on the floor (and probably began to realize what was going on). They followed into the room where a classical duet was playing Cristina Perri's "A Thousand Years." The couple danced, and Fawwaaz got on one knee to ask Sarah "Will you marry me?" Overwhelmed with excitement and emotion, she happily said "Yes" and these beautiful moments were all captured by the wonderful team of photographers at Kiss Me In Paris, and Paris videographer Julia Swell, to give them the gift of remembering every detail of this memorable moment in their lives. They then went out in the most iconic parts of Paris to take some photographs together, and returned to have a romantic dinner for two back at the Shangri-La. I have to say this proposal moved me on so many levels, and I will definitely tell this couple's love story to many people as it is too grand to keep to myself! Below are some of my favorite shots of Sarah and Fawwaaz - don't forget to watch the heartfelt video of this magnificent proposal above - it will make you day!